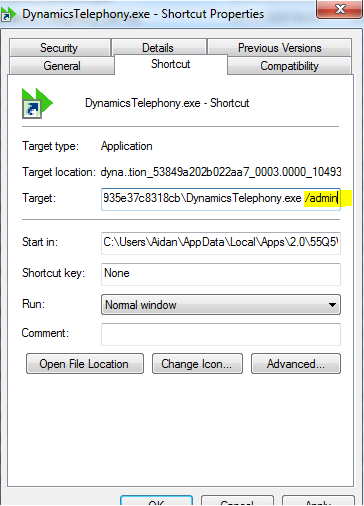 You probably want to restrict what settings and controls normal users can see in Dynamics Telephony. To do this, you must add some security roles in CRM as detailed below. If you do not add these roles and assign them to certain users, then all users will have full access. 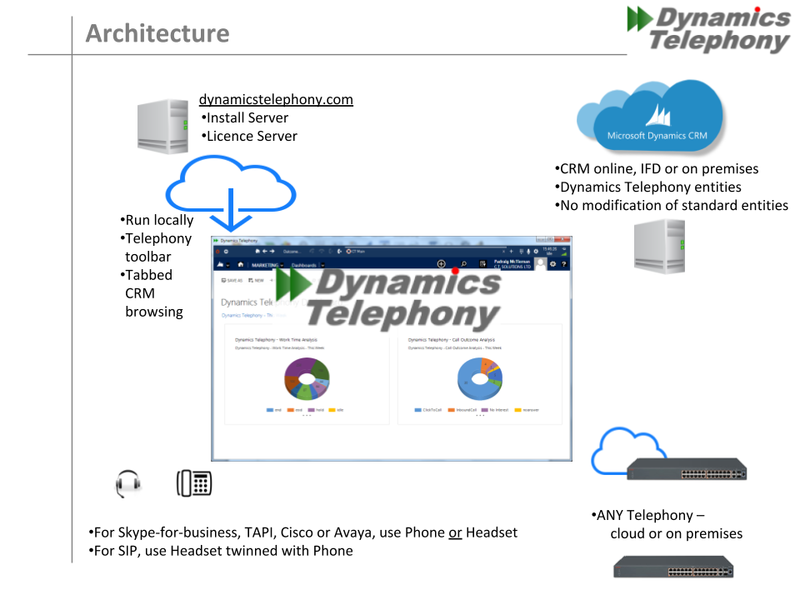 Dynamics Telephony uses 2 CRM roles to enable security features. NOTE: These roles just need to exist. They do not need any permissions assigned. 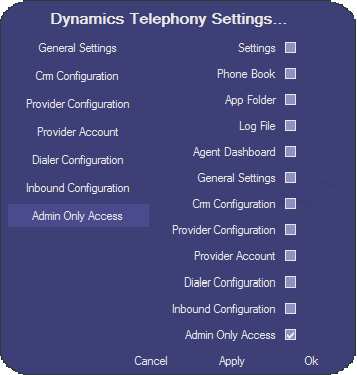 ROLE: Dynamics Telephony Admin, when assigned to a CRM user will enable the “Admin Only Access” settings area for that user. Use this area to restrict other CRM users from seeing various settings. 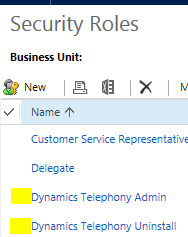 ROLE:Dynamics Telephony Uninstall, when assigned to a CRM user will enable the “Uninstall” button in Dynamics Telephony for that user. 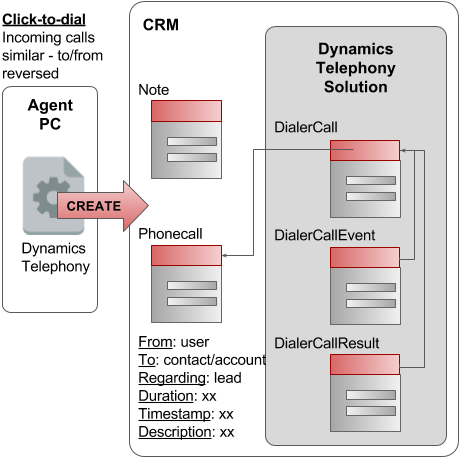 “Uninstall” will completely remove the Dynamics Telephony Solution from CRM. The best is not to assign this role to any user until you need it. Dynamics Telephony policy is to have as little impact on your CRM as possible. Here are the impacts you need to consider. As part of or submission to the Microsoft AppSource Store, install and basic tests were carried out by Microsoft Engineers. Admin Level User will be required during the install phase. This is to allow for the installation of the entities described later. This user needs to be allowed install a solution in your CRM. Authentication. Dynamics Telephony supports all authentication methods supported by CRM online or on-premises. When users use Dynamics Telephony, they simply logon to CRM as normal. HTTPS and HTTP are both supported. The certificate for HTTPS needs to be trusted by Internet Explorer. 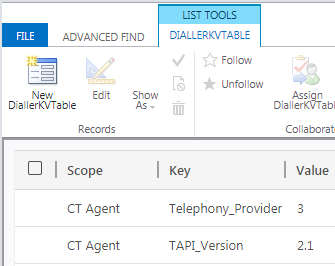 Entities Installed by Dynamics Telephony are listed HERE. The entities are all standalone with no dependency in your standard entities on the Dynamics Telephony entities. They are installed as a solution that you can request to inspect. They can be uninstalled with no impact on your CRM. – Dynamics Telephony entity records. – Phonecall due to click-to-dial or incoming calls. – Note due to click-to-dial or incoming calls. – (optional) create contact for unknown caller. IMPORTANT: For both 64-bit and 32-bit systems, you need the 32-bit version of the install. 6. Cannot logon. Logfile has “…a reference that cannot be resolved: ‘https:…” when connecting to a CRM with Certificate issues. Solution: Fix the certificate issue. Temporarily try entering the “Organization Url” in settings. You get this from CRM at Settings > Customization > Developer Resources – Organization Service. 9. Getting message “Cannot connect to CRM…”. IMPORTANT: ONLY do this if ALL users are having this EXACT issue. Otherwise, Dynamics Telephony may stop for ALL USERS. This issue usually only arises during first client installs. Solution 1: Check client PC and server properly synced to a time server. Check Microsoft KBs for updates related to time / DST for your country. Solution 2: The Service User (background user) must not use 2-factor authentication. Make a special Service User, with a very strong password, for Dynamics Telephony to use, that does not use 2-factor authentication. See here. For complete uninstall, you should clear the following directories too. NOTE: files in this folder are preserved through upgrades. The Config.crm file in this folder is the connection to CRM so it can be pushed out to users (from a working client), so that new users do not have to enter connection info. To uninstall all entities from CRM, you use the Uninstall System on the Dynamics Telephony COG Menu. NOTE: You will not see this item unless your CRM user has a Role called “Dynamics Telephony Uninstall” – the role does not need any special permissions.